Los Gatos Roofing demands quality and craftsmanship with every roof project, thus we use only our own qualified and factory trained employees. We refuse to use subcontractors and day laborers to cut costs. Our custom designed fleet of tear off and crew trucks are unmatched in their design and efficiency, allowing our foreman the ability to deliver a clean and organized jobsite each and every day. 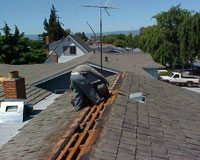 All of our tear offs are done by Los Gatos Roofing employees, who will leave your site completely clean, including the gutters. Most existing homes in the Bay Area originally roofed with wood shakes or shingles were built with spaced sheathing. This is identified by boards running horizontal to the rafters with a 4”-6” space between them. Spaced sheathing can still provide an adequate roof deck for the installation of wood shakes and shingles, or can be used as a substrate for new solid sheathing such as OSB or plywood. 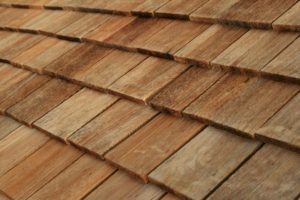 Homes originally roofed with asphalt shingles, or built after 1990, were constructed with solid sheathing, using either 1” nominal sheathing or plywood. Most all existing plywood sheathed roof decks provide an acceptable substrate for any new roof material, however solid 1×6 or 1×8 decks do require the installation of 7/16” OSB. Underlayments are no longer rated by pounds (15lb. or 30 LB) but by Type as determined by ASTM ratings. 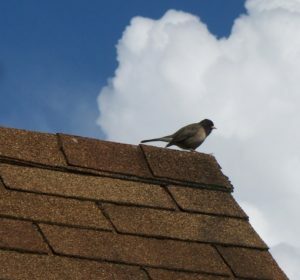 Fiberglass reinforced felt membranes are made and recommended by most shingle manufacturers, and are the only felt products warranted with the roofing product. Some low slope applications will require self-adhered membranes also made and warranted by the shingle manufacturer. 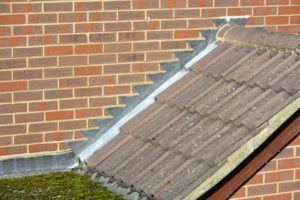 Every roof requires flashings at all valleys, walls and penetrations (pipes, vents, chimneys and skylights) to perform effectively. Los Gatos Roofing always replaces existing flashings to ensure a trouble free roof. All flashings are primed and painted to match the color of the roof. Some walls may require stucco or siding removal in order to install the correct type of flashing, most common when changing a roof from one type to another. Both Concrete and Clay tiles are available in standard weight (new construction) and lightweight (reroof) and are always installed over solid sheathing. Los Gatos Roofing recommends and installs a double underlayment of ASTM felt, and lead based two piece flashings. 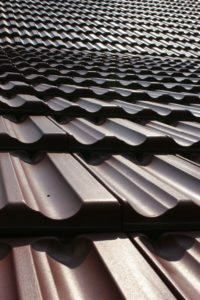 A structural inspection is available if deemed necessary, and the walkability of the roof should always be considered prior to choosing a tile roof. All shake roofs are available in Class “A”, “B”, or “C” fire ratings and are legal in all city and county jurisdictions in the Bay Area. Shake roofs require a Type 30 ASTM felt interlayment, two stainless steel fasteners per piece, and function best when installed over spaced sheathing. Different qualities of wood grain and product thickness can greatly affect the price even though the installation specifications are the same.